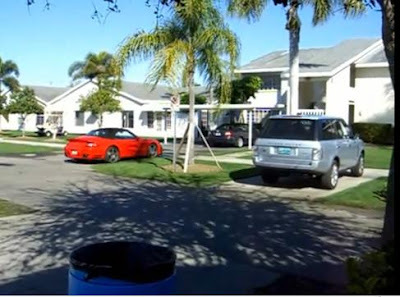 If only they were BFFs..
And as close as their cars. Maria Sharapova and Jelena Jankovic's cars were spotted parked next to each other. The two divas were having their training session at Nick Bollettieri's. Jola, the mother of a full time student at Nick's who shot this video is doing a heck of a good job! 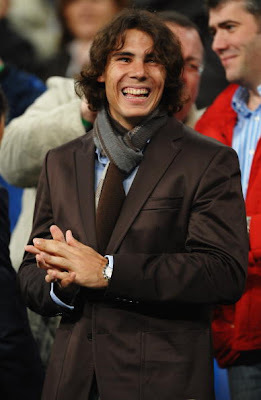 Nadal was at the Champions League round of 16, first leg match between Real Madrid and Liverpool at the Estadio Santiago Bernabeu in Madrid, Spain on Wednesday. I gave up Champions League and EPL years ago. This series was uploaded on CNN last week but as usual the IT guys at CNN still haven't fix the video embed function. Now it's available on Youtube. I love this series simply because there are more off-court scenes compare to TalkAsia's interviews with Jelena Jankovic and Zheng Jie. Is it bad karma or pure coincidence? At the beginning of this tournament, Dubai Open has already lost defending champion, Andy Roddick who boycotted the event. Other top players including Rafael Nadal, Roger Federer and Nikolay Davydenko also withdrew from this tournament due to injury problems. And in the latest development, Andy Murray pulled out from the tournament after coming down with a virus. Now this ATP 500 event is all yours, Nole! 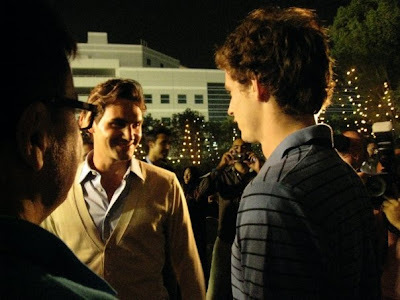 Roger: (Smiling sheepishly) Andy, I'm sorry for being a jerk at the Aussie Open. You know, all the comments about you at the press. It didn't help me to win my 14th Grand Slam anyway. Andy: (Giving Roger his trademark blank look) Oh, ok... So, what are you doing in Dubai? I thought you're not playing. Roger: Well, you see the backache is not true. Roger: I just needed more time to recover from that humiliation last month. Hehe! 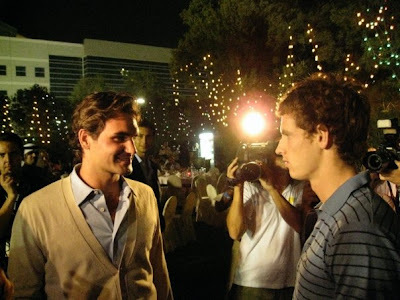 Roger: You know, I have a house here in Dubai. You want to drop for a coffee? I have a great coffee machine courtesy from *beep*. Mirka will bake you delicious donuts. We can sit down and strategize a bit. You know, you take on that Djoker and I grab my no.1 ranking back from Rafa. Andy: (And the blank look again) What do you mean? You think I can't be no. 1? Esther, thank you for waking me up in the wee hours of the morning with your text message informing me about Rendy Lu's first round victory! 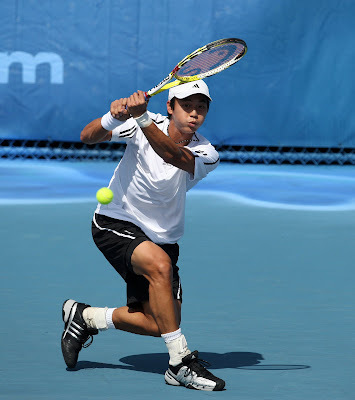 Fans were dying to see Rendy wins again after last month's victory against David Nalbandian at the Australian Open. So when Rendy defeated former world no. 1 Lleyton Hewitt in three sets, 7-5, 2-6, 6-2, we're the happiest bunch on earth! “I never thought I would win today,” said Rendy. Well, Rendy you better start believing that you can win no matter who your opponents are! Birthday boy Hewitt, who planned to have a birthday cake on court if he won the match, was probably tired after the semifinal match at Memphis last week. Here's a bit of the match report provided by the friendly media people at yellowtennisball.com. The first set was close as both Rendy and Hewitt focused on keeping the ball in play due to the windy conditions. Serving at 5-6, Hewitt double faulted at set point for Rendy. In the second set the Australian took an early lead by breaking Rendy at 1-1 and breaking again at 4-2. Hewitt seized the opportunity to serve for the set, which he took with a crosscourt forehand winner. An early break in the third gave Rendy a 3-0 lead, but after a long fifth game at 1-3, Hewitt broke back. A quick re-break by Rendy brought the score to 4-2. 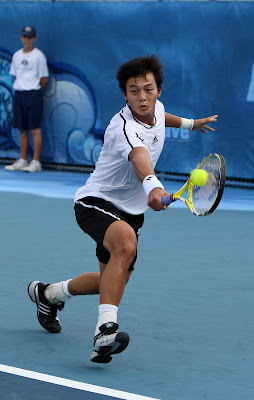 Rendy was able to hold his serve and after an unforced error, broke Hewitt who was playing on a wild card. Rendy will play Stefan Koubek next. So stay tune. In the meanwhile, here are more photos of Rendy at Delray Beach. Rendy's victory made the headlines at ATP and Delray Beach tourney websites. Here are the screen caps. You can click to enlarge. Sania Mirza will be heading to Las Vegas for a week starting March 2. There will be no time for entertainment for Sania. Instead she will spend the entire week sweating it out at Gil Reyes' training centre. "It's going to be a new experience and I'm looking forward to it," Sania said. "I've heard so much about it from Ana (Ivanovic) and (Fernando) Verdasco, who had trained there before he made the semifinals of the Australian Open." 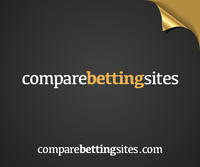 "This is going to be a short stint because I'll be playing tournaments in the following week. If it works well for me I want to go over for a longer stint in the near future." Sania will be joined by coach Sven Groeneveld at Reyes' centre. "The schedule hasn't been drawn up as yet," Sania's father Imran said. "As in, how much time she spends in the gym and how much working out, but we should have that finalized in the next couple of days," he added. After the training, Sania is hoping to get wildcards to play in Indian Wells and Miami. 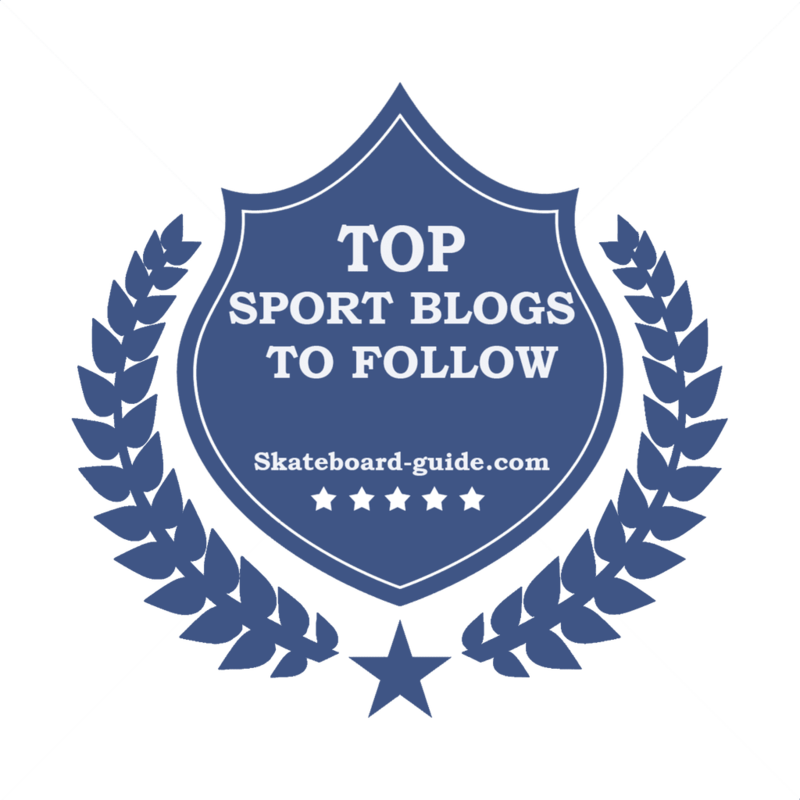 Groeneveld will be joining her at both events. No, Rafael Nadal's uncle Miguel Ángel, a former pro football player, wasn't proposing to his nephew to move from tennis to football. 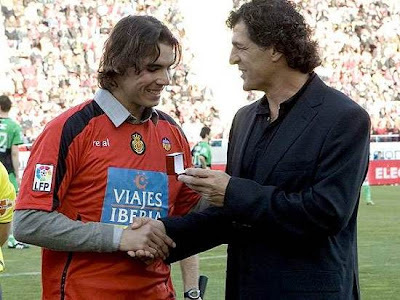 During half time of the Spanish league match between Mallorca and Racing de Santander, Matéu Alemany, one of the league’s directors awarded Nadal with a medal as a symbol for his incredible success in tennis. Uncle Toni was also honoured and received his medal. Matéu said the reason for the award was because of “the amazing journey they’ve had together in their professional careers, which has taken them to the top of the world rankings and has made Rafa the best Spanish sportsman in history”. Rafael Nadal the new face for Lanvin "L'Homme Sport"
Rafael Nadal signed a deal with Paris-based Inter Parfums to be their global ambassador for its Lanvin line of fragrances last October. 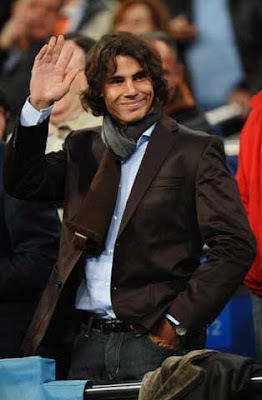 Nadal who helped develop a new Lanvin fragrance called "L'Homme Sport" was supposed to arrive for a summer 2009 launch. But we don't mind it to be earlier, aren't we? Inter Parfums is planning to launch the brand throughout Europe and the US. Not sure when it's going to be made available in Asia. Yesterday, Barclays Dubai Tennis Championships top seed and world. 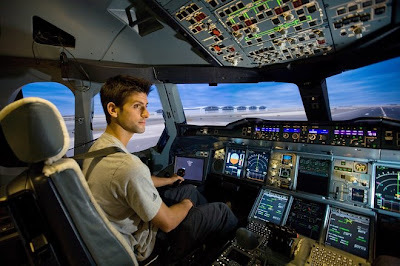 3 Novak Djokovic had his first experience in a flight simulator courtesy of Emirates. The A380 flight took Djokovic on his chosen route, from Belgrade to Dubai. He flew with Emirates Captain Milan Kosanovic, a fellow Serbian. “It’s always fun to do this kind of activities in Dubai, last year I skied indoors at the Mall of Emirates and this year the flight simulator. I had so much fun, it looked so real,” said Djokovic. On the other hand, Andy Roddick, who won at Memphis last weekend, 'flies kite' (translated from Cantonese 'FFK') by withdrawing from the tournament as a protest to the UAE's decision not to grant Israeli player Shahar Peer a visa to compete in last week’s women’s event.